Mean, moody, magnificent. 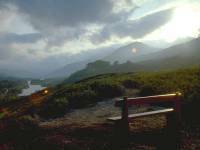 The Scottish Highlands account for roughly a fifth of Britain's total area, yet less than two percent of our population live there. This is a land of mountain, moorland, forests and lakes. It's a land of wild, silent places, of huge skies and magnificent landscapes, of challenge and adventure. It's also a land of inclement weather, an aspect the Scottish Tourist Board usually likes to keep quiet about. The west coast of Scotland is smack in the path of the cyclonic storms that sweep across the Atlantic and many locations receive more than 200 inches of rain a year. Glowering skies, torrential downpours and windstorms are a fact of life in the Highlands and have ruined many a promising holiday. But when the sun does shine the Highlands are a wonderland. This is one of the most beautiful places on Earth. 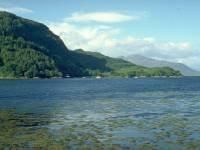 The Highlands are one of the few areas of western Europe that could arguably be described as a wilderness. The mountains, the climate and the infertile soil make this an inhospitable place. Roads are few and far between. It can be as much as twenty miles to the nearest habitation. Citizens of the western USA or the Australian interior would probably laugh out loud at such figures, but here in overcrowded Britain they are astonishing. This is not a comfortable, homely mountain area such as the English Lake District. The scale is far grander. 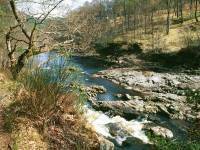 Recreational use of the Highlands is not long established. The Highlands were historically a region of wild clans, a place avoided and shunned by the rest of the country. It's still only 250 years or so since an army of Highlanders marched south, intent on usurping the throne for Charles Edward Stuart (aka Bonnie Prince Charlie). After this episode military roads were driven through the glens, and barracks were built in strategic places. 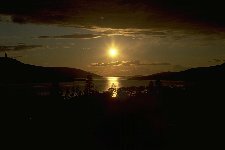 A century of subjugation followed, culminating in one of the worst disgraces of recent Scottish history - the infamous Clearances, in which much of the population of the Highlands were forcibly evicted from their homes and packed off in ships to the colonies. The landowners had decided that sheep were more profitable than people, and the land was emptied. This empty land is now the preserve of the hunting and shooting fraternity, and also of the walker and climber. The balance is not always an easy one, for it's the hunters and shooters that own most of the land. 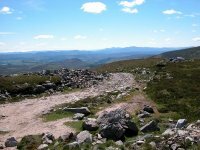 But the mountains, moors and hill tracks have been attracting outdoor enthusiasts in significant numbers since early in the 19th century. 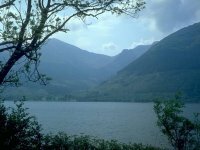 It might be imagined that there are hills and mountains too numerous to comprehend, but a systematic mapping survey in this era was followed up by a group of enthusiasts who set out to list and classify the Scottish hills. 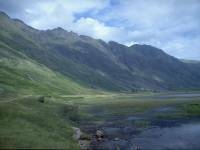 This group was to become the Scottish Mountaineering Club, and the outstanding chronicler of these hills was Sir Hugh Munro. Munro published his famous Tables in 1891. In them, he listed nearly 300 mountain summits that exceeded 3000ft in height. The list was subjective - he never gave any criterion for inclusion or exclusion. The debate about what differentiates seperate mountains rather than seperate summits of the same hill is one that continues vigorously to this day. 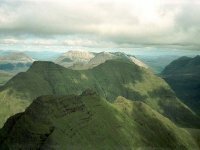 The current version of the Tables lists 284 summits - collectively known as Munros - and the challenge of climbing them all has mushroomed. There exists a species of walker known as a "Munro bagger", who is dedicated to reaching the summits of each and every Munro to the exclusion of everything else. Some decry the Munro baggers, others recognise the compulsion of the challenge. As well as the Munros there are other "lists" to tick; the Corbetts, the Donalds, the Grahams, the Marylins et al. A mountain doesn't have to be 3000ft high to be worth climbing. 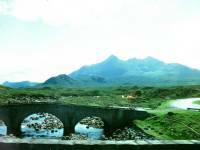 The Highlands of Scotland divide down naturally into distinct areas and mountain groups. Each area has its own index page, and each area index lists individual walks, each with its own photo gallery. Click the thumbnails in each walk index for a full-size (800 x 600) image. John Butler, Biggleswade, Bedford, England. 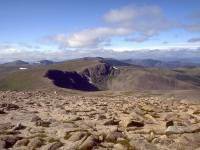 Stephen Kennedy's site on Scottish waks and mountain data - good photos! 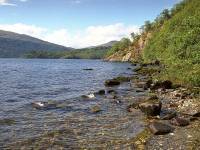 Carmen Mardiros's Flavour of Scotland site with a nice selection of digital photos. hor. You may download and archive them; you may use them as wallpaper or backdrops; you may alter and manipulate them for your own amusement. You may not use them for commercial gain. You may not pass them off as your own. If you wish to place any of them on your own website, or otherwise redistrubute them or make them available for public access, you are required to contact the author first for permission. Original credit and a copyright notice will be a manditory condition before such a request is granted. If you derive any new image wholly or partially from these imges, such as a manipulation or composite, and you wish to publish any resulting image or use it for commercial gain, you are similarly required to contact the author for permission, and to give original credit, and to append a copyright notice to any such image.